Touching Distance is a historical fiction based on the life of Alec Gordon, the man who in 1790 discovered the truth behind the spread of childbed fever, or puerperal sepsis, a disease more deadly than plague. It is an absorbing and beguiling read, part mystery, part love-story. Abrams is gifted in creating a sense of place and time, allowing the reader to suspend the things we take for granted today. We are reminded that the doctor had to walk for miles to see a patient, and that the conditions of the time were not as sanitary as they are now. You feel the bone weariness of Alec Gordon and the pressures that fell to him because of the time he was born into. This was the period of great enlightenment, as shown in Alec Gordon and the movement of medicine, but there was also great resistance, in Touching Distance in the form of the stoic midwives operating in the homes of the granite streets of Aberdeen. It was in these streets that Alec Gordon charted his observations, which lead to his great scientific discovery. Abrams creates a strong character in Alec Gordon, a methodical, focussed man who is determined to save women in childbirth. It is not until later in the book that this drive begins to make sense, when some of his childhood is revealed to us. As Alec is trying to save the lives of others, his own marriage is breaking apart. For much of the book, the reader has sympathies with Elizabeth Gordon on her cold, distant husband. Elizabeth’s character is perhaps the most complete (more so than Alec Gordon even) in the book, as Abrams shows her descend into a tortured madness, with relief found in the opium stolen from her husband’s medical supplies. Elizabeth seems to be an unreliable witness, and my sympathies were often thrown between the polarities of this fractious marriage. Abrams choses to share with us near the end of the book Elizabeth’s back story, a story that is revealed to Alec as he kneels at her bed, trying to save her, but unable to save the marriage. The backstory is an extraordinary subplot that had me completely hooked, with links to Antigua and the slave trade. I can still see the powerful scene of Elizabeth’s two brothers and her flight through the jungle. 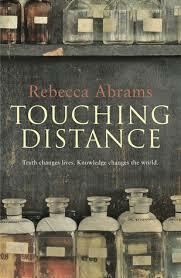 Abrams writing is wonderful, and her research is evidently extensive. At times the writing is truly graphic, with vivid, toe-curling scenes. Abrams doesn’t shun the gritty, grimness of the birthing room of the time. And yet, Touching Distance is written with tenderness for the endeavour. It is a remarkable story of a much unsung hero, not only in the medical profession, but in saving the lives of thousands and thousands of women. Abrams has crafted a fabulous story of what might have made the man.